Includes carrying case (pictured), tuning wrench and set of both 4" and 8" legs for the taller player. Maple and walnut rectangular soundbox, spruce soundboard with veneer of birds-eye maple, maple neck and pillar. 6-staved soundbox built of walnut, maple neck and pillar, laminate soundboard. 29 strings: all monofilament nylon. Option to purchase full spare set for additional $90. Model style "A", serial #2472, built approx. 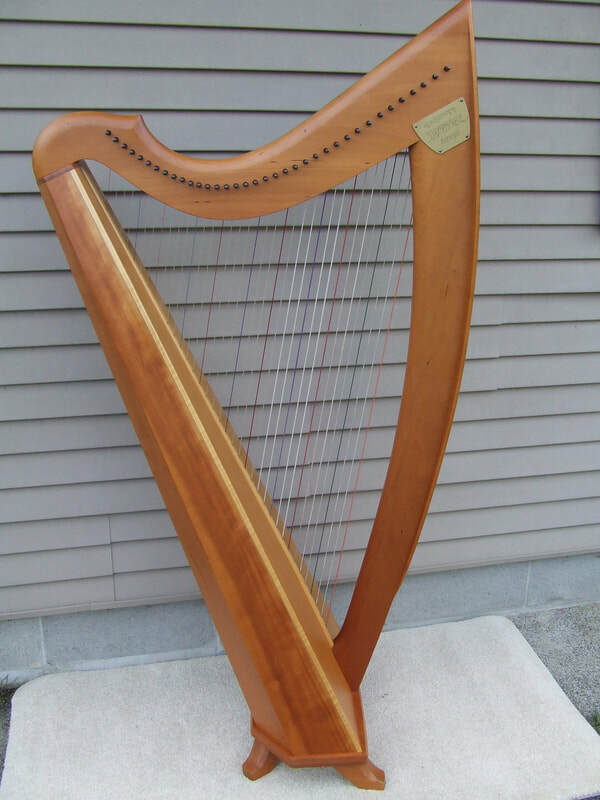 1940s-1950s by luthier and harpist Melville Clark in Syracruse NY. Birdseye maple soundbox, curly maple neck and pillar, spruce soundboard. Unique Celtic-theme gilt decorations over most of harp.